At a number of car view points around the the Island (including the Carisbrooke Priory and Yarmouth east View Points) will be found a plaque or stone with text along the lines of : "For your enjoyment of this view. W.R.J. 1872-1954. THE REES JEFFERYS ROAD FUND." 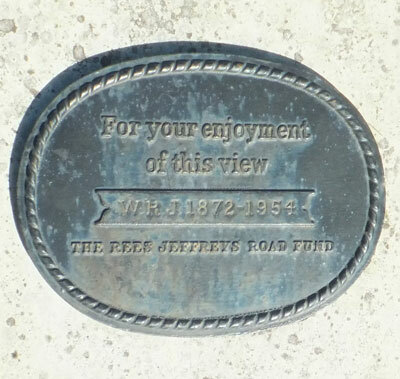 The Rees Jeffreys Road Fund is a national charity endowed by the estate of William Rees Jeffreys Hon.MTPI.,C.I.Mech.E to provide support for education and research in transport; and helps fund projects that improve the roadside environment for motorists and other road users. So, not directly connected to the Island, but we do benefit from its funding.